Where would you like to leave your tread marks? Area 51 is my next stop. 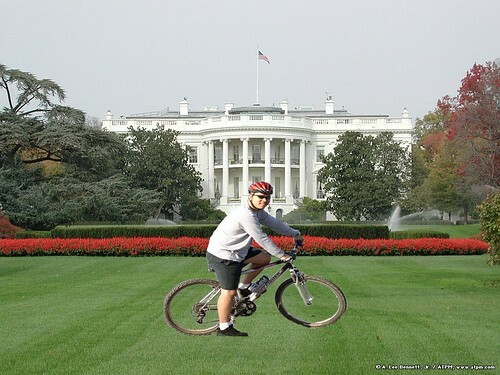 To the National Security, this is obviously not a real picture. Please don’t send the Men In Black. You didn’t see me on the Hummer? On Saturday, August 12, the view north from the top of Charleston Peak toward Area 51, and all the other “areas”, looked pretty bleak. So, before you decide to take on Area 51 try out Bootleg Canyon near Boulder City, Nevada. There you can test yourself riding up hills in the desert heat. The trails in Bootleg Canyon are bicycle only. Besides, at Bootleg Canyon you won’t suddenly be surrounded by Humvees filled with troops pointing M-16s at you. I mean, honestly, they even set up a ramp for me….